Your annual fix for pro motorcycle racing simulation is coming around again, with MotoGP 18 a few weeks away from clearing this year’s lap. Developers Milestone S.r.l. have big plans in mind for this year’s iteration, which will drop the aging engine that’s powered the last few games in order to provide a fresher, more detailed take on MotoGP. Check out the best racing games on PC. Milestone boast that their switch to Unreal Engine 4 will allow for more realistic lighting, particle, and weather effects, and their newly reworked track design is meant to more faithfully recreate those real-world racing locations. This year’s game also features face-scanned renditions of every MotoGP rider for the most accurate experience. You can also expect a reworked physics system, AI that will offer both better challenge and scalability, a more nuanced damage system, and a greater focus on tyre management. You can also look forward to 30 cutscenes adding a little more flair to the starting line and your victories, more detailed stat tracking, an online spectator mode, and a new selection of tutorials to help you build your racing skills. Career mode will have you ranking up from the Red Bull MotoGP Rookies Cup all the way to the top championship, building your reputation and making big adjustments to your bike for optimum performance. 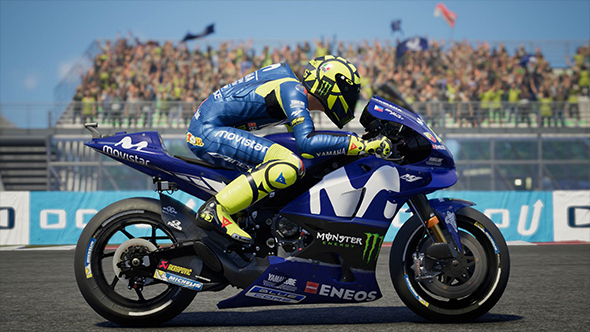 MotoGP 18 launches June 7 on PC and consoles, promising 19 official tracks and the full official roster from the 2018 MotoGP season.